Sign the Petition Against Abortion Up-to-Birth HB-51! 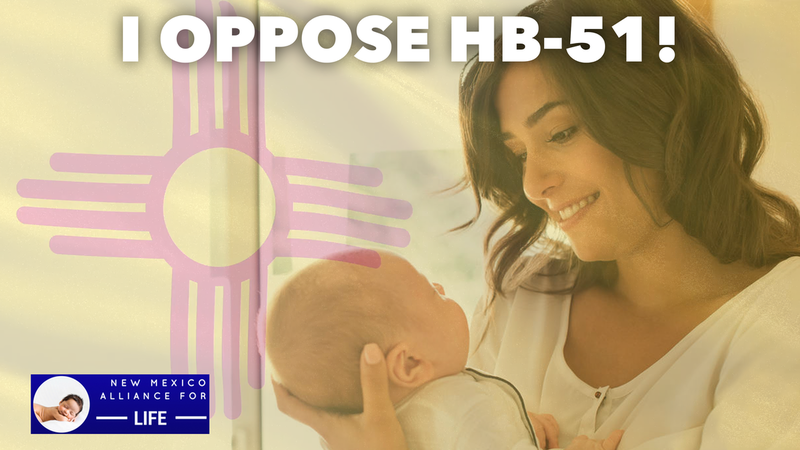 Sign the petition urging members of the New Mexico legislature to oppose the radical abortion-up to birth HB-51! HB-51 Does Not Protect Women HB 51 keeps dangerous late-term abortions, up to birth, legal for any reason. The risk of death or serious injury to women increases to 89X in abortions after 5 months. HB-51 Does Not Protect Children The majority of New Mexicans support parental involvement in a minor's abortion, (67%). HB-51 Does Not Protect Doctors HB 51 strips away the only explicit conscience protection for doctors and other medical professionals that protect them from being forced to participate in abortions. 72.% of New Mexicans support a medical professional's explicit conscience protections from performing abortions. I urge you to act with urgency against this dangerous measure." Add your address in the comments so your legislators will see if you're in their districts! NMAFL takes your security seriously. Your contact information is always kept private. ​By signing the petition, you will be added to the email list. ​CLICK HERE For a printable petition sign-up sheet, if you would like to collect additional signatures to help NMAFL reach our 15,000 name goal. Once you have gathered your signatures, you can take a picture with your phone, then email it to elisa@nmallianceforlife.org for addition to the petition. Don't forget to follow us on Facebook and Twitter!